The dinoflagellate Cochlodinium geminatum can form near-monospecific blooms which have occurred at the same location in the South China Sea repeatedly in the last decade. Here, we demonstrate the allelopathic effects of C. geminatum isolated from the bloom waters of the Pearl River Estuary, South China Sea, in August 2011, which inhibited four of six co-occurring phytoplankton species tested. Inhibition increased with rising cell density and reached a maximum in the declining growth stage. Four different C. geminatum culture components negatively affected growth of Akashiwo sanguinea in order of decreasing percent inhibition: sonicated culture, filtrate of sonicated culture, whole-cell culture and filtrate of whole-cell culture. The highest inhibition was at 25 °С and salinities of 30 PSU and light intensities of 100 μmol photons m−2 s−1. Overall, our study showed that C. geminatum could inhibit growth of phytoplankton competitors during succession of phytoplankton community, achieving nearly monospecific blooms, and the allelopathic effects were regulated by environmental factors. Jiaying Yan and Jingya Liu contributed equally to this work. Many species in the unarmored dinoflagellate genus Cochlodinium (Gymnodiniales, Dinophyceae), especially Cochlodinium polykrikoides and Cochlodinium fulvescens, can cause harmful algal blooms (HABs) commonly and globally (Lee 2008; Tang and Gobler 2009; Kudela and Gobler 2012; Iwataki et al. 2015). In recent decades, the HABs caused by Cochlodinium have been frequently reported in some Asian countries, particularly Korea and Japan (Yamatogi et al. 2006; Matsuoka and Iwataki 2009; Matsuoka et al. 2010; An et al. 2015; Lim et al. 2017). In China, however, emerging blooms of Cochlodinium geminatum occurred twice in the coastal waters of the Pearl River Estuary, in April and October–November 2006. Cochlodinium geminatum was regarded as a newly recorded HAB-causing dinoflagellate in the South China Sea (Ou et al. 2010; Shen et al. 2012). Moreover, C. geminatum blooms recurred in October 2009 and August 2011 in the same area of the Pearl River Estuary (Wang et al. 2011; Pang et al. 2015; Zhang et al. 2017), causing massive fish mortalities and economic losses (Guo et al. 2014). It seems that C. geminatum is now a common bloom species in the Pearl River Estuary. So far, little is known on the provenance of C. geminatum. However, recent study showed that C. geminatum can produce resting cyst via germinating cysts in sediment samples from the South China Sea and Bohai Sea, China (Lan and Gu 2014), which suggested that this species may be distributed worldwide through ballast water. Many studies have shown that dinoflagellate species often have low growth rates compared with other phytoplankton (Steidinger and Haddad 1981; Smayda 1997). This means that it should be difficult for C. geminatum to overcome other phytoplankton species and form blooms. Nonetheless, according to field investigations, C. geminatum can form near-monospecific and persistent blooms (Ou et al. 2010; Wang et al. 2011). For example, the highest cell density of C. geminatum was ~ 3 × 107 cells L−1 during the bloom in 2009, accounting for more than 99% of phytoplankton density (Shen et al. 2012; Pang et al. 2015). Additionally, water samples of the C. geminatum bloom in 2009 inhibited growth of Prorocentrum micans and Heterosigma akashiwo (Wang et al. 2011). A possible explanation for its unusual dominance is that C. geminatum may possess other ecological strategies, such as producing allelochemicals to outcompete co-occurring phytoplankton species. The effects of allelopathy during HABs remain unclear, although it has been hypothesized to play an important role in species succession (Keating 1977) and the formation or maintenance of harmful algal blooms (Smayda 1997). Cleberc et al. (2007) found that filtrate from cultures of Cylindrospermopsis raciborskii (Cyanobacteria) and the lake water sampled during a bloom of C. raciborskii had an allelopathic effect on most target species. Furthermore, the allelopathic effect can be influenced by abiotic factors, such as irradiation, temperature, and salinity. Uronema confervicolum (Chlorophyta) had a higher production of allelopathic compounds under higher light intensity (Allen et al. 2017). The allelopathic effect is also temperature-dependent, as toxic Microcystis aeruginosa (Cyanobacteria) strains inhibited the growth of Chlorella vulgaris (Chlorophyta) more at high temperatures (≥ 25 °C) (Ma et al. 2015). Furthermore, the allelochemical production of the picocyanobacterium Synechococcus sp. was regulated by light, temperature, and salinity (Śliwińska-Wilczewska et al. 2016). Moreover, since C. geminatum is difficult to isolate and culture under artificial conditions, relationships between its growth and basic environmental factors remain unknown. However, it is conceivable that these environmental factors may regulate adaptive strategies of C. geminatum, such as allelopathic effects, and result in blooms under suitable conditions (Shen et al. 2012). Thus, whether C. geminatum is allelopathic to co-occurring phytoplankton, what exactly the function of any allelopathy is within its blooms, and how environmental factors regulate its growth and allelopathic effects are unanswered. This study explores potential allelopathic effects of C. geminatum on six co-occurring phytoplankton species. We investigated how cell density, growth stage, and different extracts of C. geminatum cultures influenced allelopathic performance. Furthermore, we explored how environmental factors such as irradiation, temperature, and salinity regulated its allelopathic activity. Two clonal strains of Cochlodinium geminatum (JX25 and JX26) were established by micropipetting single cells from bloom samples collected using a 20-μm phytoplankton net from the coastal water of Zhuhai, Guangdong, China, in August 2011. The species was identified and classified using light and scanning electron microscopy as well as LSU and SSU rDNA sequences. Total DNA of C. geminatum was extracted from 10 mL of exponentially growing culture using a plant DNA extraction kit (Tiangen, China) according to the manufacturer’s protocol. Approximately 1400 bp of the LSU rDNA was amplified using primers of GmLsF (forward, 5′-aggattcccthagtaatggcgaatg-3′) and GmLsR (reverse, 5′-ggtcgaatagaaccatttcgtcacc-3′), and an approximately 1661 bp of the SSU rDNA was amplified using primers PsF (forward, 5′-tgccagtagtcatatgcttgtctc-3′) and PsR (forward, 5′-tccttcygcaggttcacctacgga-3′). The PCR reactions were performed with a final volume of 25 μL, containing 9.5 μL ddH2O, 12.5 μL 2 × Taq PCR MasterMix, 1 μL of each PCR primer (10 mmol), and 1 μL of the DNA template. The amplification was performed with an initial denaturation at 94 °C for 5 min, 35 cycles at 94 °C for 20 s, 55 °C for 30 s, and 72 °C for 2 min, and a final elongation step of 10 min at 72 °C. The PCR products were checked in a 1% agarose gel containing ethidium bromide and visualized with ultraviolet light. The targeted bands were purified by an agarose gel DNA fragment recovery kit (GENEray Biotechnology, China), ligated with pMD-18T cloning vector (TaKaRa, Japan), and then sequenced (Sangon, Shanghai, China). The sequences were deposited in GenBank with accession numbers MF445291 (LSU) and MF445297 (SSU). The detailed method and identification results are included in another study (Hu et al. unpublished). The target algal strains used in the co-culturing experiments included three species of dinoflagellates (Akashiwo sanguinea AS2, Karlodinum veneficum JX24 and Prorocentrum micans JX8), a diatom (Skeletonema costatum JX6), a haptophyte (Prymnesium parvum JX12), and a cryptophyte (Rhodomonas salina CCMP1319). All JX strains were collected from the Pearl River Estuary, established and maintained in our laboratory. Strain CCMP1319 was donated by Christopher J. Gobler from Stony Brook University. Culture AS2 was provided by Y. Z. Tang and isolated from Chesapeake Bay. Cultures were grown in natural seawater with a salinity of 18 PSU with the f/2 medium (Guillard 1975) under conditions of 20 ± 1 °C, ~ 100 μmol photons m−2 s−1 and a photoperiod of 12:12 h (light/dark). Cochlodinium geminatum in the exponential growth phase (4 days after inoculation) was respectively co-cultured with the six species of microalgae described above in 10-mL culture tubes for 72 h under the same conditions used for maintaining cultures. The f/2-Si medium was added at the beginning of the experiment to ensure sufficient nutrition in the experiment. Initial concentrations of C. geminatum and the target algae were 500 cells mL−1. Monocultures of C. geminatum and target species under the same conditions were used as controls. All treatments and controls were in triplicate. During the incubation, the morphological changes and behaviors of cells were observed and photographed every 24 h under a light microscope (Nikon Eclipse E200, Japan). At the end of incubation, some cultures were fixed with Lugol’s solution (final concentration of 2%) for counting under the microscope. Effects of different strains, growth stage, and cell density of C. geminatum were investigated for inhibition of A. sanguinea. Because A. sanguinea was sensitive to C. geminatum in the prior algal bioassay and was large enough to count, it was chosen as a model target alga in the following experiments. Two C. geminatum strains, JX25 and JX-26, were chosen to compare their responses to allelopathy. After growing for 4 days, JX25 or JX-26 (final cell density 500 cells mL−1) were added into a 10-mL culture tube for co-culture with A. sanguinea AS2 for 72 h under the same conditions used for maintaining cultures. The f/2-Si medium was added at the beginning of the experiment to ensure sufficient nutrition in the experiment. Monoculture of A. sanguinea AS2 in f/2-Si medium was taken as a control. All treatments and controls were in triplicate. The initial cell density of AS2 in the experiment was also 500 cells mL−1. After 72 h of culturing, samples were fixed with Lugol’s solution (final concentration 2%) for counting under the microscope. For growth stage and cell density assays, we conducted experiments with C. geminatum JX25 cultures at different growth stages: middle exponential, stationary, and declining stages. Cultures were filtered with 0.22 μm pore size polycarbonate filter and then diluted with the f/2-Si medium to a series of cell-free culture filtrates with corresponding cell density gradients of 100, 500, 1000, 2000, and 2500 cells mL−1. Akashiwo sanguinea AS2 grew in different-stage and different-cell density culture filtrates of JX25 for 72 h. The f/2-Si medium was added at the beginning of the experiment to ensure sufficient nutrition in the experiment. All treatments and controls were in triplicate. Sampling and counting methods were as described above. The different components of C. geminatum cultures were tested for inhibition of A. sanguinea growth. We prepared four different components of C. geminatum culture: whole-cell culture, culture filtrate, sonicated culture, and sonicated and filtered culture. After incubation for 4 days, we obtained 250 mL cultures of C. geminatum JX25 for later experiments. First, culture filtrate was obtained by filtration of 50 mL of the cultures through a 0.22 μm polycarbonate filter to remove cells. Then, other 100 mL cultures were sonicated with a high power sonicator (JYD-900L, China) and we checked under a microscope to ensure acquiring broken cell culture. Last, to obtain the sonicated and filtered culture, we took 50 mL of the sonicated cultures and used it for a further filtration with a 0.22 μm polycarbonate filter. Akashiwo sanguinea was co-cultured with the four components of C. geminatum JX25. The initial cell densities for C. geminatum and A. sanguinea were 500 cells mL−1. All experiments were performed in 10-mL culture tubes for 72 h under the same conditions used for maintaining cultures. The f/2-Si medium was added at the beginning of the experiment to ensure sufficient nutrition in the experiment. Monoculture of A. sanguinea at the same cell density in the f/2-Si medium was used as a control. All treatments and controls were in triplicate. Every 24 h, 1mL samples were taken out and fixed with Lugol’s solution (final concentration 2%) for counting under the microscope. To explore the effects of light, temperature, and salinity on allelopathic activities of C. geminatum, strain JX25 was cultured under different conditions: (a) two light intensities of 5 and 100 μmol photons m−2 s−1; (b) three temperatures of 15, 20, and 25 °C; and (c) four salinities of 10, 18, 25, and 30 PSU. Other conditions were as for the maintaining cultures if not noted. Strain JX25 was grown under the above conditions for at least two transfers, before use in experiments. The exponential cultures were added into 10-mL culture tubes (initial cell density 800 cells mL−1) to co-culture with A. sanguinea AS2 for 72 h under the same conditions used for maintaining cultures. The f/2-Si medium was added at the beginning of the experiment to ensure sufficient nutrition in the experiment. The AS2 cultured alone in the f/2-Si medium and the same condition (light intensities, temperatures, and salinities) as experimental group was the control. The initial cell density of AS2 in the experiment was 500 cells mL−1. All treatments and controls were in triplicate. Every 24 h, 1 mL samples were taken and fixed with Lugol’s solution (final concentration 2%) for counting under the microscope. where Ninhibition is the inhibition percentage, Ntreatment is the number of live target algae in treatments, and Ncontrol is the number of live target algae in controls. In experiments 1, 2, 3, and 4, allelopathic significance of C. geminatum was tested with t test in Minitab v.17. Two-sample t tests were used for comparing the data under different irradiation conditions. Multiple comparisons were conducted in R, using Tukey’s HSD in the multiple comparisons package to assess the differences among treatments in experiments 2, 3, and 4. In all cases, significance levels were set at p < 0.05. In this study, the experiments only caused a minor fluctuation of pH. The pH in these experiments ranged from 7.4 to 8.6, below noxious effects level on marine protists (Pedersen and Hansen 2003; Xu et al. 2015). Moreover, ambient nitrate and phosphate concentrations were above 70 and 2.96 μM after 72 h co-culturing, which means nutrients were above the half-saturation of these nutrients for most phytoplankton (Smayda 1997). Thus, nutrients unlikely influenced the results. Co-culture experiments showed that C. geminatum JX25 had different effects on the six kinds of microalgae (Fig. 1). 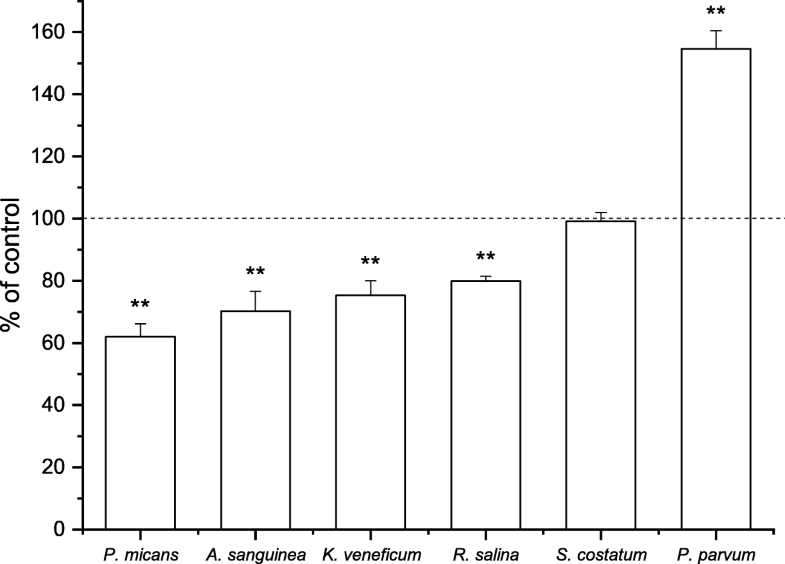 After incubation for 72 h, JX25 strongly inhibited growth of P. micans, A. sanguinea, K. veneficum, and R. salina, especially P. micans with an inhibition rate of 40% (p < 0.01, t test). In contrast, growth of P. parvum was markedly promoted by JX25 with a promotion percentage of 55% (p < 0.01, t test). However, JX25 had no significant effect on S. costatum growth (p > 0.05, t test). Strains JX25 and JX-26 both significantly inhibited growth of A. sanguinea after 72 h of co-culture (29.5 and 32.4%, respectively), but with no significant difference in inhibition effect between JX25 and JX26 (p > 0.05). Filtrates of C. geminatum JX25 in different stages showed allelopathic activity on A. sanguinea, and this was enhanced with increasing cell density of JX25 (Fig. 3). All treatments in this experiment displayed significant inhibition effects on A. sanguinea except the 100 cells mL−1 of mid-exponential growth stage (Fig. 2) (p < 0.05, t test). When initial cell density was 2500 cells mL−1, A. sanguinea showed the highest inhibition in declining growth stage of C. geminatum (44.3%), followed by stationary growth stage (41.1%) and mid-exponential growth stage (36.8%) (Fig. 2a) (p > 0.05, multiple comparisons). When initial cell density was 2000 cells mL−1, A. sanguinea showed the highest inhibition in declining growth stage of C. geminatum (41.1%), followed by stationary growth stage (41.0%) and mid-exponential growth stage (36.2%) (Fig. 2a) (p > 0.05, multiple comparisons). Moreover, the inhibition effect on A. sanguinea was significantly enhanced with increasing cell density in every growth stage of C. geminatum (Fig. 2b) (p < 0.05, multiple comparisons). 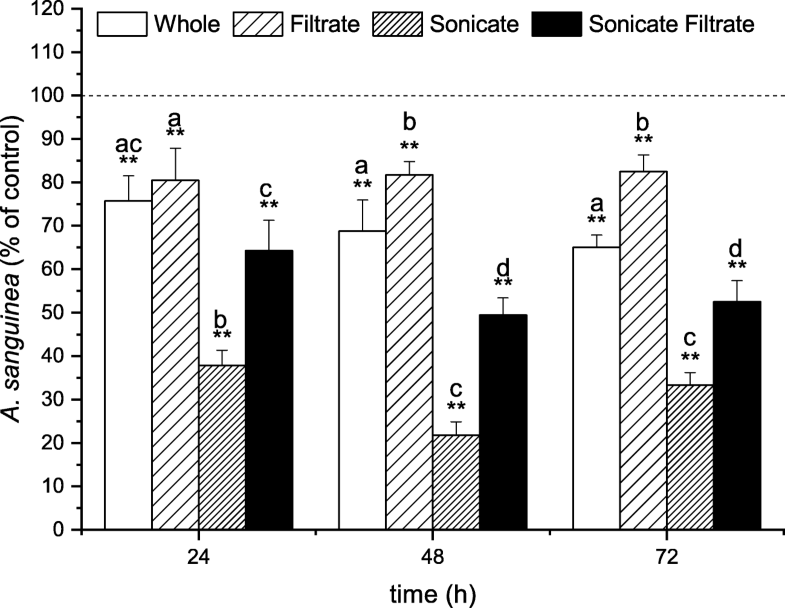 Four C. geminatum culture fractions including whole-cell culture, culture filtrate, sonicated culture, and sonicated culture filtrate all displayed significant inhibition effects on A. sanguinea (Fig. 3) (p < 0.05, t test). After incubation for 72 h, A. sanguinea showed the highest inhibition in sonicated culture (66.7%), followed by sonicated and filtered culture (47.5%) and whole-cell culture (35%), with the lowest inhibition rate for culture filtrate (17.5%). Sonicated culture clearly had the strongest inhibition of A. sanguinea with the highest inhibition of about 80% at 48 h. Compared to sonicated culture, sonicated culture filtrate had lower inhibition of about 50% at the end of the experiment. Whole-cell culture exhibited stronger inhibition of A. sanguinea with prolonged incubation time. However, the inhibition of culture filtrate to A. sanguinea was the lowest and nearly the same at 24, 48, and 72 h. The order about inhibition effect of four different C. geminatum culture components to A. sanguinea is as follows: sonicated culture, filtrate of sonicated culture, whole-cell culture, and filtrate of whole-cell culture (strong to weak, p < 0.05, multiple comparisons). Cochlodinium geminatum JX25 grew well in both high (100 μmol photons m−2 s−1) and low (5 μmol photons m−2 s−1) light intensity for 72 h (Fig. 4a). The growth of JX25 under the two light conditions showed no significant difference (p > 0.05, two-sample t tests). However, JX25 grown at high light intensity had a stronger inhibition effect than at low light intensity (p < 0.05, two-sample t tests) (Fig. 4b). Inhibition percentages toward A. sanguinea with high light condition were 13, 16.8, and 21.8% at 24, 48, and 72 h, respectively, but the average inhibition under low light was only 1.2% at 72 h.
Cochlodinium geminatum JX25 also grew well across the wide temperature range of 15–25 °C (Fig. 4c). There were no significant differences in growth rate between different temperature treatments (p > 0.05, multiple comparisons) within 72 h. However, JX25 grown at different temperatures exhibited varying inhibition abilities (Fig. 4d). Inhibition percentages toward A. sanguinea at 20 °C were 12.6, 18.9, and 20.9% at 24, 48, and 72 h, respectively, showing a time effect. Treatments of 20 and 25 °C had nearly the same inhibition for A. sanguinea; however, there was no significant inhibition at 15 °C (p > 0.05, t test) in 48 and 72 h.
Similarly, C. geminatum JX25 grew with a wide salinity range of 15–35 PSU, but only had a significantly higher growth rate at medium salinity (18 PSU) in 48 and 72 h (Fig. 4e) (p > 0.05, multiple comparisons). High salinity (25 and 35 PSU) resulted in a decrease in cell density of JX25 with time. Inhibition abilities of JX25 in different salinity treatments significantly differed (p < 0.05, multiple comparisons). Inhibition percentages toward A. sanguinea at 18, 25, and 30 PSU were 18.5, 18.7, and 30% at 72 h, respectively, and also increased over time (Fig. 4f). 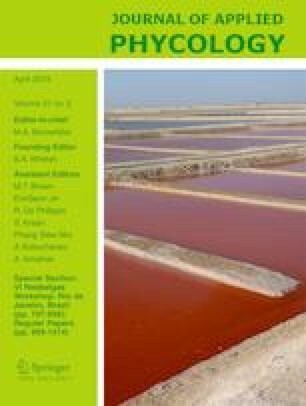 Our study showed that growth of four common microalgae, P. micans, A. sanguinea, K. veneficum, and R. salina was significantly inhibited by C. geminatum, indicating that C. geminatum was allelopathic to co-occurring phytoplankton. There was no significant difference between the allelopathic effects of two strains of C. geminatum (JX25 and JX26) on A. sanguinea, indicating that allelopathy of C. geminatum was not confined to a single strain. Some studies have suggested that the sensitivity of co-occurring phytoplankton is one of the most important factors affecting the allelopathic effects of harmful species (Granéli et al. 2008a; Xu et al. 2015). We found that allelopathic effects of C. geminatum on co-occurring phytoplankton were species-specific. For example, it was interesting that the growth of P. parvum was not inhibited by C. geminatum, and developed a higher population density (Fig. 1). Because the effect of allelopathy is an interaction between phytoplankton (Granéli and Hansen 2006; Chia et al. 2018), C. geminatum and the target species can both allelopathically affect each other in some cases. Much research has demonstrated that P. parvum can produce prymnesins and have a powerful allelopathic effect on multiple phytoplankton species (Fistarol et al. 2003). Remmel and Hambright (2012) found that P. parvum can use toxin-assisted micropredation in order to facilitate its growth. Thus, it seemed that P. parvum could even utilize organic materials from C. geminatum to obtain a higher growth rate. Our experiments also showed that growth of S. costatum was barely affected by C. geminatum (Fig. 1), which is in good agreement with a previous study in which S. costatum was not inhibited by water from HABs of C. geminatum (Wang et al. 2011). Co-evolution has been proposed to explain why some algae have resistance to allelopathy (Suikkanen et al. 2004). Many studies have shown that inhibition of S. costatum from multiple allelopathic species is not significant (Kubanek et al. 2005; Prince et al. 2008), and even its presence can mitigate the toxicity of other phytoplankton (Xu et al. 2017). Consequently, they can coexist with dominant microalgae during blooms, even becoming the dominant species after termination of blooms. In fact, S. costatum was observed in water samples during C. geminatum blooms (Ou et al. 2010; Shen et al. 2012) and replaced it as the dominant species over predecessor allelopathic organisms following a C. geminatum bloom (Pang et al. 2015). In this sense, allelopathy plays an important role in phytoplankton community structure as well as succession during HABs and can even influence the direction of succession. Moreover, competitor sensitivity to C. geminatum allelopathy is variable among species, thus the allelopathic effect is species-specific. Our results showed that cell density of C. geminatum was positively correlated with allelopathic intensity within the same growth stage—the higher the density of C. geminatum, the stronger the allelopathic effect on target species. Other researchers also have reported that the effect of allelopathy of P. parvum on target algae depends on the cell density of both algae and target algae (Granéli and Salomon 2010). These results were consistent with an earlier study that demonstrated that P. parvum produced more allelochemicals with increased cell density (Tillmann 2003). The growth stage of microalgae is also an important biological factor affecting its allelopathic effects. For example, Nodularia spumigena (Cyanobacteria) in the exponential growth stage has stronger allelopathic effects on Thalassiosira weissflogii (Bacillariophyta) and Rhodomonas sp. (Cryptophyta) than in the stationary stage (Suikkanen et al. 2004). Our study showed that the three growth stages of microalgae filtrates all inhibited the growth of A. sanguinea, and the effects of inhibition from strong to weak were in order of declining, stationary, and medium exponential growth stages, especially in higher cell density groups. There was a limitation on obtaining high concentration of C. geminatum culture in laboratory; however, it was reasonable to assume that this variation tendency would be more remarkable at higher cell density. Pichierri et al. (2017) found that the allelopathic effect of multiple diatom species on Ostreopsis cf. ovata (Dinoflagellata) increased with age of culture, consistent with our results. It is possible that, with prolonged culture time, the allelochemical(s) secreted into the filtrate from cells of C. geminatum increased and accumulated, resulting in stronger allelopathic effects in the late growth phase. Sun et al. (2012) performed a similar study, showing that the concentration of allelochemicals secreted from Isochrysis galbana (Haptophyta) to the culture medium increased from the exponential to declining growth stage, and the strongest allelopathy effect was also the declining growth stage. In experiment 3, all the four different fractions of C. geminatum culture were able to inhibit the growth of the target species, A. sanguinea, with varying inhibition rates (Fig. 3). It is particularly meaningful to compare the relative allelopathic activity among the four different C. geminatum culture fractions, which provided insight into the source and characteristics of the allelochemicals and relative contributions of the intra- and extra-cellular allelochemicals to the effects. The filtrate of C. geminatum displayed significant and stable inhibition effects on target species, while whole culture had increasing inhibition effects during the experimental period, suggesting cells of C. geminatum can produce and release allelochemicals to ambient medium continuously and allelopathic activity is independent of live C. geminatum cells (or cell contact); the allelochemicals can be effective at least in 72 h. Similarly, Qiu et al. (2012) found that the inhibition effect of H. akashiwo (Raphidophyceae) on A. sanguinea was stronger in co-culture than filtrate. Obviously, the stability of allelochemicals was varying among different phytoplankton species. For example, studies showed that the filtrate of P. parvum inhibited T. weissflogii (Bacillariophyta), Rhodomonas cf. baltica (Cryptophyta), and Prorocentrum minimum (Dinophyceae) in 36 h, but the target species can recover after 36 h (Granéli and Johansson 2003; Fistarol et al. 2005). The sonicate and sonicate filtrate treatments displayed significantly higher inhibition effects on target species than those in whole culture and filtrate treatments, indicating the allelochemicals were released from C. geminatum and the majority of them were stored intra-cellularly, which was consistent with our previous study on the allelopathy of Pseudonitzschia spp. (Xu et al. 2015). The sonication paralleled some aspects of cell lysis and zooplankton grazing in a natural context. We believe this method was an important approach to prove that the growth-inhibiting effects observed in co-culture experiments were mainly caused by allelopathy, because it excluded effects of cell contact, nutrient competition, pH, and light shading, and sonicated filtered treatment further excluded the effect of broken cell debris. There were studies that showed that some dinoflagellates can prey on other target species by cell contact, such as Alexandrium pseudogonyaulax (Dinoflagellata) phagocytosed Heterocapsa rotundata (Dinoflagellata) by mucus trap (Blossom et al. 2012). Our filtrate, sonicate, and sonicate filtrate experiments provided evidence that allelopathic effects in C. geminatum do not rely on the existence of live cells or cell contact. While whole-cell culture and filtrate experiments established the allelopathic capability of C. geminatum, it is worth pointing out that the effects of digestive enzyme or other metabolites during cell lysis may be involved in inhibition effects on target species. On account of the complexity in allelopathic effects observed in the experiments, extraction and separation of allelopathic compounds from C. geminatum culture are significative, which were included in a subsequent study (Cai et al. unpublished). The allelopathic effects of C. geminatum were influenced by abiotic factors, such as light, temperature, and salinity. The light intensity not only affects the growth of phytoplankton, but also has some effect on its toxicity and allelopathic effects, which in turn determines interspecific competition between phytoplankton (van Rijssel et al. 2007; Prasetiya et al. 2016). Our results showed that C. geminatum displayed stronger allelopathic activity at higher irradiance compared to that at lower irradiance. Similarly, C. raciborskii (Cyanophyceae) had stronger allelopathic activity to Ankistrodesmus falcatus (Chlorophyceae) under high light conditions (Antunes et al. 2012). The competitor microalgae can grow well at high light intensity, which can result in fierce competition under higher irradiance. As a consequence, producing an allelochemical becomes an important strategy for increasing competitiveness of C. geminatum under higher irradiance. Temperature is an important factor influencing the growth, development, reproduction, and seasonal distribution of phytoplankton, and has different effects on the metabolism of enzymes, the absorption and utilization of nutrients, and the cell division cycle (Granéli and Salomon 2010; Ma et al. 2015). However, it remains unclear how temperature changes affect phytoplankton allelopathy. Field investigation showed that a high density of C. geminatum occurred when temperature exceeded 26.5 °C during blooms (Ou et al. 2010). In this study, we found the strongest inhibition abilities of C. geminatum for the highest temperature condition (25 °C); nevertheless, the temperature rise did not influence C. geminatum growth. The densities of A. sanguinea in the control group increased along with the rising temperature from 15 to 25 °C during our experiment. If similar growth occurred in the treatments, it could cause an underestimation of the allelopathic activity of each C. germinatum cell in high temperature treatments as allelochemicals are immobilized by the greater number of target cells. Even though, we still observed higher allelopathic effects in high temperature treatments in 72 h, supporting that allelopathic activity of C. geminatum was stronger at higher temperature. Similarly, Marion van Rijssel et al. (2007) stated that the hemolytic activity of Phaeocystis pouchetii (Haptophyta) was enhanced with increasing temperature and light. Our results indicated that C. geminatum needed to compete with A. sanguinea for limited resources, and the ability for allelopathy may afford C. geminatum advantages in this competition for resources, consistent with previous studies (van Rijssel et al. 2007). Salinity has an important effect on the growth, distribution, and release of toxins from phytoplankton (Landsberg 2002). For example, Prymnesium blooms usually break out in low salinity (1–2 PSU) water bodies (Edvarsen and Paasche 1998), and ichthyotoxic C. polykrikoides expands rapidly in water of 25–40 PSU (Kim et al. 2004; Yamatogi et al. 2006; Matsuoka et al. 2008). Our results showed that growth of C. geminatum was not good with high salinity conditions (25 and 30 PSU); however, it grew normally with low salinity (10 and 18 PSU), consistent with results of a field investigation in which blooms occurred at salinity of 15.49–17.92 PSU (Ou et al. 2010). Our results showed that salinity of 18 PSU was suitable for growth of C. geminatum. Changes in salinity may also affect production of allelochemicals in marine microalgae (Granéli et al. 2012). In our salinity experiment, there was no inhibitory effect on A. sanguinea at the low salinity of 10 PSU by the end of the experiment; however, with increased salinity, the inhibition was significantly enhanced, indicating that high salinity may stimulate C. geminatum to produce more allelochemicals. The allelopathic effect of C. geminatum on co-cultured phytoplankton was significant at our tested ranges of salinity and temperature during HABs of C. geminatum (Pang et al. 2015). Thus, allelopathy plays a key role in the process of HABs. A previous study indicated that HAB could not form due to allelopathy, because allelopathic effect almost only existed in very high cell density (Jonsson et al. 2009). Field study showed that the cell density of C. geminatum was as high as around 30, 000 cells mL −1 during the blooms (Pang et al. 2015). In experiment 2, we observed strong allelopathic activities of C. geminatum on A. sanguinea in relatively lower cell density treatments. It is worth noting that even under the lowest cell density (100, 500 cells mL−1), the growth inhibition activities were still significant (Fig. 2). These results provided useful information supporting the potential role of allelopathic effects in the succession of phytoplankton community and the formation of C. geminatum blooms. Our temperature and salinity experiments showed that C. geminatum had lower growth rates under high salinity, but its inhibition activities were stronger, compared with lower salinity conditions. It seemed that C. geminatum exhibited higher allelopathic effects under adverse conditions. However, metabolic energy is needed to produce allelochemical(s) for metabolism (Pan et al. 1998). More allelochemical(s) are produced by C. geminatum under adverse conditions with the increasing consumption of energy. Why does C. geminatum produce allelochemical(s) during stress? It is possible that C. geminatum inhibits other phytoplankton by increasing allelopathic activity and so increasing its competitive advantage. Thus, it compensates for adversity in order to compete for limiting resources (Granéli et al. 2008b). Many studies have shown that target species are more sensitive to allelochemicals under stress conditions (Fistarol et al. 2005; Granéli and Hansen 2006; Granéli and Pavia 2006), meaning that it is more efficient for an allelopathic effect because of both the increasing production of allelochemical(s) and the sensitive target. Therefore, allelopathy is an important competition strategy for C. geminatum. We found that C. geminatum was allelopathic to four of six competing phytoplankton species and the effect of allelopathy differed according to target species. The strongest negative impacts on A. sanguinea of four different components from C. geminatum cultures, from strong to weak, were sonicated culture, filtrates of sonicated culture, cell culture, and filtrates of whole-cell culture. However, the allelopathic intensity of C. geminatum was positively correlated with its cell density and closely associated with its growth stage, and the strongest allelopathic effect was during the declining phase. The allelopathic effect of C. geminatum was influenced by environmental factors including light intensity, temperature, and salinity. Moreover, the allelopathic effect increased under stress. Our results suggest that allelopathy plays an important role in phytoplankton community succession. Because C. geminatum is allelopathic, this may be a strategy for competition that helps it to stay dominant in maintenance of blooms. This work was supported by the National Natural Science Foundation of China (NSFC) [Grant Nos. 41576159, 41676099]. We thank two anonymous reviewers for their careful work and thoughtful suggestions that have helped improve this paper substantially.